Recently we started a series reviewing blower-style GPUs that are popular in professional workstations and servers. Today, we have a ZOTAC Gaming GeForce RTX 2070 Blower style GPU review (part number ZT-T20700A-10P.) Although the card has gaming in the title, we are going to focus primarily on compute performance. The NVIDIA GeForce RTX 2070 features the same 8GB of GDDR6 memory that we saw in our ASUS Turbo RTX2080-8G review, but a lower amount of CUDA, RT, and Tensor cores. 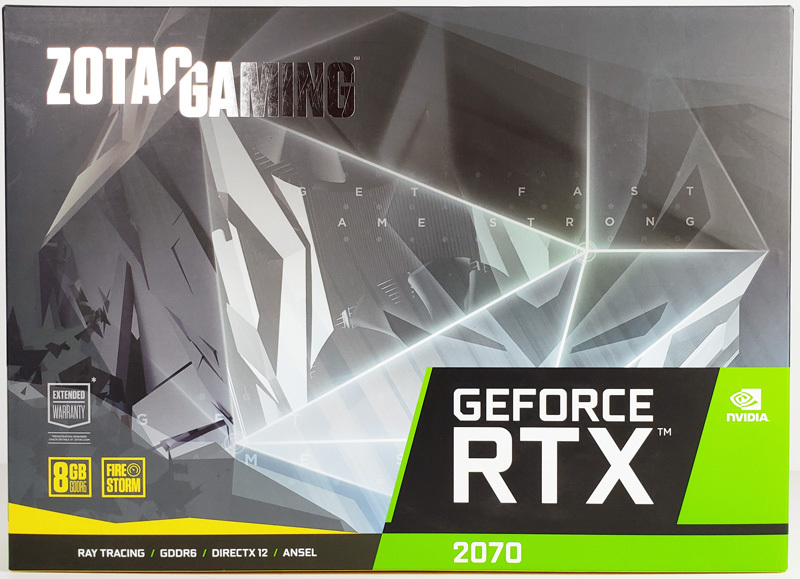 The GeForce RTX 2070 series is an exciting package as we expect to see lower power draw and thermal footprint while maintaining acceptable performance profiles. 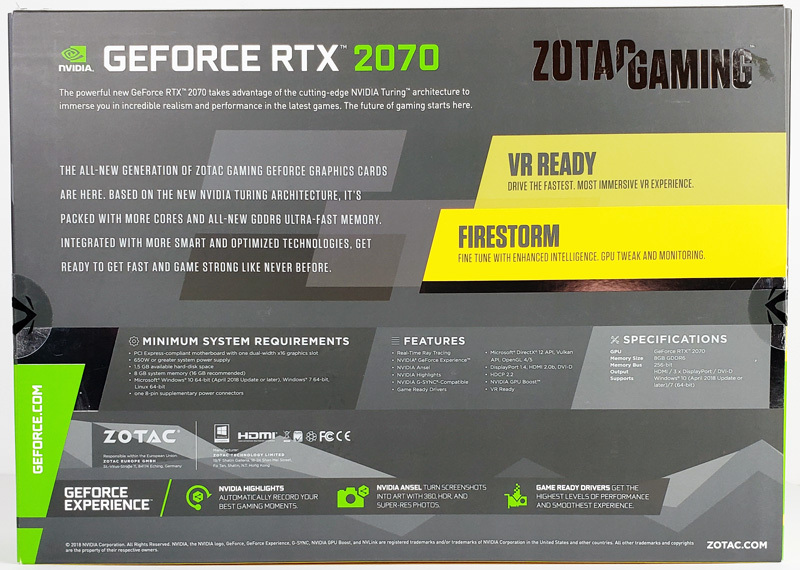 With the price of GeForce RTX 2080 Ti cards hovering around $1400-$1500, this Zotac GeForce RTX 2070 Blower GPU costs only about a third of its larger brethren. 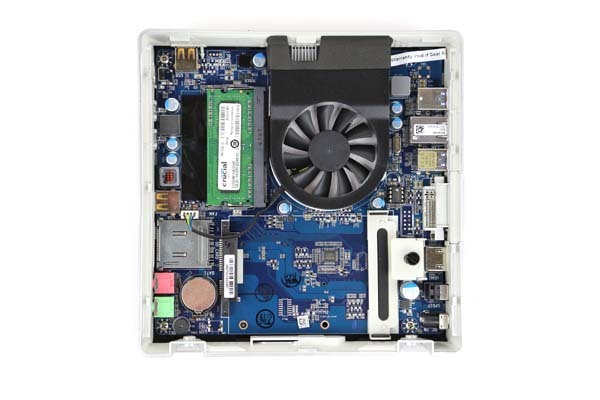 The retail box is significant in size for a GPU of this class. It is colorful and displays the necessary information that describes the product in detail. There is only one small DVD size package for the accessories which says head over to ZOTAC’s website and download the latest drivers and software. The ZOTAC Gaming GeForce RTX 2070 Blower edition follows along with the monolithic block and double slot design. The length of the GPU is 10.55”. An 8-Pin power connector at the top supplies the needed power and we see the improved blower fan on the side. 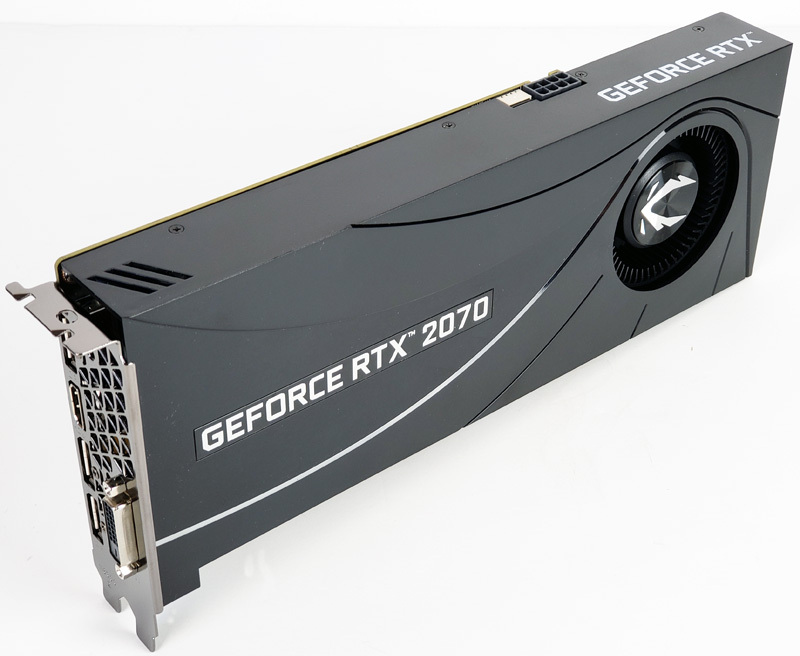 We also note that there is no SLI edge connector at the front of the card as we found on the RTX 2080 Blower cards. The front of the ZOTAC Gaming GeForce RTX 2070 Blower is clean, and only the blower fan is visible. 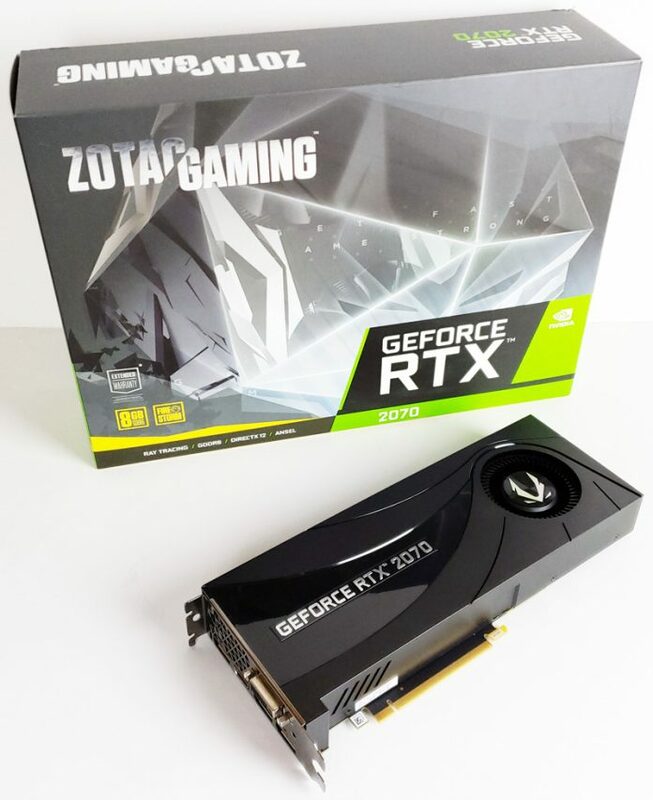 With lower power requirements the ZOTAC Gaming GeForce RTX 2070 Blower’s PCB is considerably shorter than the GeForce RTX 2080s, this frees up space at the back which allows for secondary fan openings which should help in cooling a great deal. Display outputs provided by 3x DisplayPort 1.4 ports and a single HDMI 2.0b port. Instead of a USB Type-C port, ZOTAC uses a standard a Dual Link DVI-D port. The DVI port provides for legacy monitor connectivity without using adapters; we have not had a monitor that uses DVI ports for years here in the lab, 4K display users will want to use DisplayPort. The target market for this card is 1440p gamers, and here the DVI connector will come in handy for displays used in this category. Next, we are going to look at the ZOTAC Gaming GeForce RTX 2070 Blower software and key specifications before moving onto our performance review. Great job, this article. Deep learning benchmarks would make it even better! Especially for this card, as many claim its has the best value for DL: http://timdettmers.com/2018/11/05/which-gpu-for-deep-learning/.